Must I Have a Seam? Has anyone had problems with pods leaving black rings on lighter colored quartz? It’s happened twice now and its super-annoying to both our installers and customers. Magic Eraser pulls 90% of it off, but it’s still visible to us. I should note that we clean our pods regularly, and leave the plastic wrap on the pieces as much as possible. Unless there is some awkward turn that would prohibit a piece that large coming in, then I don't see any reason for a seam. Same as Brett. If the path from the entry point in the house will allow the piece to maneuver all the way in to that room, I don't know why a seam would be needed. This is just based on the information provided so far. Ask your fabricator to explain why they need to put a seam in it and then work from there. There could be a very small chance that the fabricator priced you a remnant he already had, which could be saving you some money but the remnant may not be 108" to get the vanity out in a single run. Very good point about the remnant. Also, you haven't mentioned if the vanity is in between 3 walls. If it is, and the back of the vanity is a good amount longer then the back and you’re not getting splash, that might be a reason as well. If it is brand-new material and you're getting splash, I would not seam that. Yes, it is between three walls but there will be Silestone backsplash on all three sides. It is supposed to be new material. The house is new but the original white ice granite has a crack all the way through on the right front corner of the left sink which also has the seam. When I asked about the seam he said something about "we have to do it that way." Anyway, they are replacing the granite under warranty and we decided to switch to quartz as it is in the same group. I asked by email if they would be adding the same seam and he replied yes. It strikes me that the original granite cracked because of the seam and someone knocked the end of the slab where the seam was breaking off one piece - which they then installed hoping I wouldn't notice. I have had an E30, E36 and E46 M3 - loved each one. It should be no problem for the fabricator to provide a slightly more-detailed explanation than "we have to do it that way." The fact that the White Ice has a seam as well leads me to believe there may be something specific to the room. You can also post pictures of your bathroom. Here is a picture of the vanity and a closeup of the seam on the left-hand sink. The crack is from the right corner of the same picture but you have to blow the picture up to see it - very obvious in person LOL. I'm not sure what conditions based on what you've presented would require a seam. Quartz is easier to install as it weighs slightly less and is typically more forgiving for an installer, especially with proper technique. Since you are going to have splashes I wouldn't accept a seam. As for the vanity, quartz in 1 piece shouldn't be a problem. Probably the granite in 1 as well with a product called Sink Savers. It would be difficult to get it in there considering the vanity runs the width of the room. You have vanity mirrors on both sides and door trim. 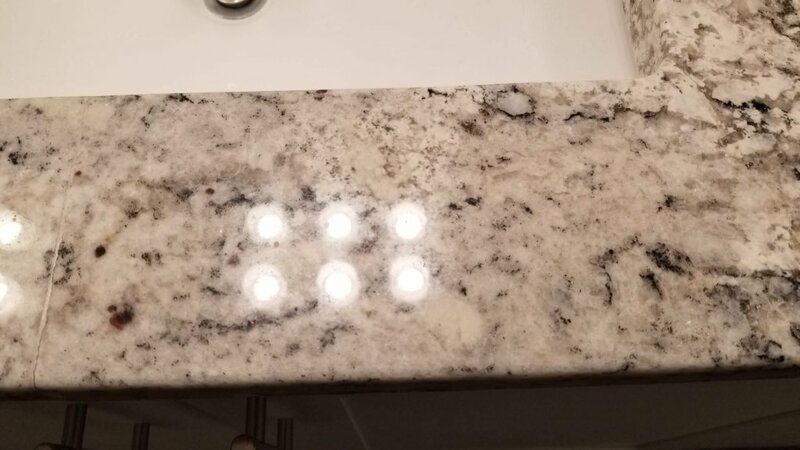 The top would have to be laid flat in the air and while keeping 1 end in the air, the other end on the cabinet, slide it in all the way and then set it down. We would taper the sides from front to back creating a gap on the back sides that would aid in getting it in, but be covered by the splash. I would just tell the fabricator that you won't accept a seam in the replacement. I hate it when people do that to me but in this situation, I think it could be done. They might refuse since it's a warranty replacement and you’re not holding onto any money. Maybe offer to remove the door trim ... good luck. I am still waiting for the installer to reply to my email - will update when he does. Might be a situation where the installer can’t high/low that piece in because of the medicine cabinets on the sides. It's not the easiest piece to install in one piece but it's certainly doable with the info provided. Are there any turns from the front door to the bathroom where a 108" won't fit through? Think about trying to carry a 9’ long 2x4 through your house without tilting it up or down. Will it make it? Door width is almost never the problem. To add to Andy's questions, is this room upstairs? If so, can the installers safely maneuver a 108" top up the stairs? If there is a full clear path to the room, take one of the medicine cabinets or side mirrors (whichever is the case) down to give more room to high/low the top in place. I agree with everything else said....we don't have enough info to truly say it can be or can't be done. FYI....High/Low....in case it's not clear that is how we describe putting a top in when you set one end down low (on the cabinet) and hold the other end up (high) so you can slide it back to where it needs to be. Then you lower the high end down. If there are outlets, switches, medicine cabinet, etc .in the way this is not possible. And if the walls are narrower at the front then the back, you will not be able to go flat and slide it back into place. All, Thank you for taking time to respond. To answer your questions. The bathroom is located on the main floor and can be accessed from the street through two 96" high doors. The path would entail a right turn followed by a left. I did trace the path using a tape measure extended to 108" and I did not see any issues assuming the slab could be moved vertically and then tilted to clear the second door. Even the seamed slab would need to be maneuvered vertically and tilted slightly. For the high low/installation - the door of one medicine cabinet could be removed leaving only a half-inch protrusion. Still waiting to hear back from the fabricators but I have been told that Pulte requires the fabricator to limit a single slab to 96" to minimize "potential damage". Tilting a rectangle makes it longer. It also makes moving the piece riskier for breakage and far more dangerous. That vanity weighs over 300 lbs and you're expecting them to just lift it over their head and carry it around a corner without damaging your home, the piece, or themselves. So if you can't walk around those corners without manipulating the angle of the tape measure, you've got a situation that could warrant a seam. Again, the 96" height is completely meaningless in this application. Discuss it with your fabricator, express your wishes and then accept their position. Your beef is with the builder (Pulte), with whom you have the warranty. It is not fair to blame the fabricator, when he is simply following the protocol of the company buying his services (dictating the policies). Talk to the Builder. No matter how many responses you get here, they are meaningless. You are talking to the wrong people (and wasting everyone's time) by leaving out key information. Even if you take the door off the medicine cabinet, the countertop will likely hit the 1/2" protrusion. Without all the information, I'm more likely to side with the fabricator. Most fabricators do not want to put seams in countertops as it just adds time and labor to the job. You can only get so many hands on this countertop. No one can stand behind it and take the weight from the backside. It is not an easy lift and anytime you do this you risk injuring a back. Maybe their policy includes looking after their employees’ health. Our policy is that we get to decide where to put a seam. We had a customer make a big stink about putting a seam in her en-suite (granite). 10’ long two sink cutouts, up the stairs and hi/lo it around the corner. No thanks. Our policy says we get to decide and I'm not risking our health and the customer's property by not putting a seam in place. So the customer got a piece of quartz for her closet from our competition. No cutouts. "They got it in without a seam" she emails me. This is exactly why you got a seam, lady, because we get to decide and you have no idea how the process works. 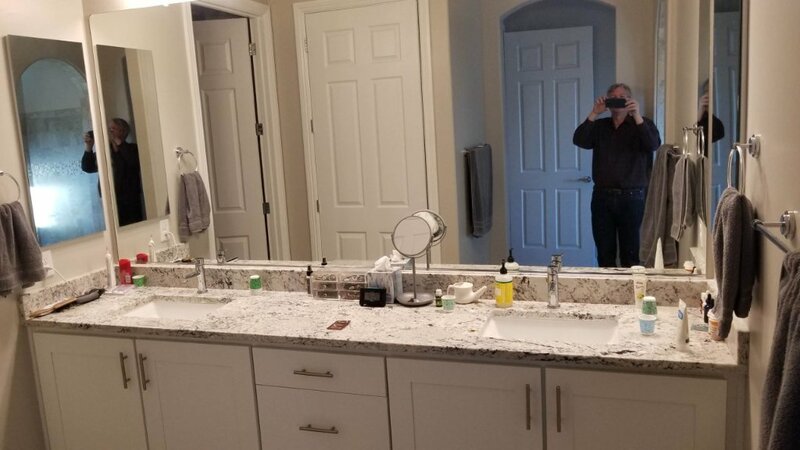 Just FYI granite with two sink cutouts between three walls 10’ long. IT NEEDS A SEAM. The other point is other fabricators are on here talking about "we'd have done it with no seam." Those are the guys you need to stay away from. Yes, it may be possible but without asking the questions and finding out the clearances you have no idea if this is going to work. It does not make our job easier to add a seam. We're adding a seam to protect our people, your property and the integrity of our business. Just because it is possible it does not mean it is practical. Walking through your house with a tape measure is not nearly the same as hauling a 10' x 2’, 300+ piece of stone. Last thought - you are going to be that customer who then complains about scratches on his walls after getting your 10’ piece in place. It’s going to happen. It sounds to me like your fabricator knows his stuff. Trust him to do his job and we'll not tell you how to sell insurance or land airplanes or do any of your jobs. CHECK OUT THE SFA FORUM!